Sorry, no emulator rom image yet. The mapper configuration is still a bit broken. Hopefully will be fixed during the next week. cool enough for an invitation. sweet colors. low on effects but highly cute, good music too! Visy: I have the flashcart, it was left at the partyplace. "Total Martyr Super Luxus ticket"
I lol'd. Then I came. scenerhub.pl: Not my flashcart at least. I have mine right here. Maybe it's the small red one (for Atari 2600)? Yeah it is. Will get it to you at asm. starbuck: how could we forget! Sweet sweet invitation. Could someone convert those nsf files to mp3? The music rocks. great invitro.. all the best for altparty! one of the best nes demos. Cute invitro, good use of the NES sound hardware. Would have been a thumb alone for properly using the platform. 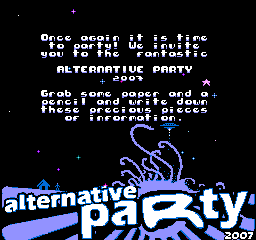 I didn't really fancy the gfx all that much, but the music is good and overall it's a nice invitation. I play it in loops! page created in 0.018385 seconds with 16 queries.